In this article explained about some basic concepts in geometry like definitions of lines, line segment and ray. Also explained properties and differences for the same. A line is breadthless length. Line is a set of infinite points which extend indefinitely in both directions without width or thickness. A line can be defined as the shortest distance between any two points. From the above figure line has only one dimension of length. A line may be straight line or curved line. But generally the word “line” usually refers to a straight line. 3. A line has no end points and has infinite number of points on it. 4. We are unable to draw a line on a paper just we represent it on paper. 5. A line denoted by ” ” . Here the arrow heads in opposite directions of line suggests that it extends in definitely in both the directions. A line-segment is a part or portion of a line with two end points. It is the set of all points between the end points and also including endpoints. In the above figure P and Q are two points and the shortest distance between them is called a line segment. So total line segments – 6 nos. 4. 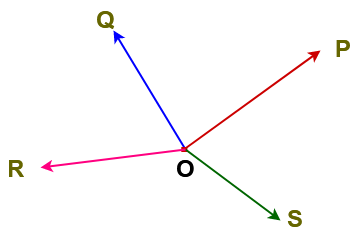 The distance between two points P and Q is called length of denoted as PQ. Two lines segments are said to be congruent, if their lengths are equal. A ray can be defined as, it is a part of a line with one end point. A line segment extending endlessly in one direction is called Ray. 1. A ray has only one endpoint also called initial point or starting point. 2. A ray has no definite length. 3. There is one and only one ray having given point as initial point and passing through another given point. 4. In the below figure is a ray with starting point P and is a ray with starting point Q. Here and are different. 5. Infinite number of rays can be drawn with the the same initial point. Here , , , are rays with same initial point O. 6. Since a ray is endless in one direction. We are unable to draw it on paper but just we represent it. Opposite Rays: Two rays with same initial point and extending indefinitely in opposite directions along the same line, then such rays are called opposite rays. Here , are called opposite rays. Thanks for reading. 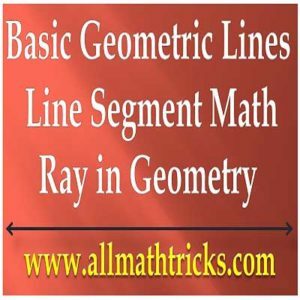 I Hope you liked this article “Definitions and Properties of Line, Line segment and Ray in math”. Give feed back, comments and please don’t forget to share it.